A research team developed a new design of concrete structural blocks , to improve their thermal insulation properties and contribute to the reduction of emissions of polluting gases. The modifications made to the blocks optimize the thermal efficiency of the walls against the oscillations in air temperature throughout the year. Interested in contributing their knowledge to reduce greenhouse gas emissions, the group of researchers in Bioenvironmental Engineering of the National University of Luján, led by Eduardo Yarke, took as a starting point the emissions of these gases that occur (directly or indirectly) due to the conditioning processes, both in the production of cold and heat, in homes and buildings of all kinds (energy consumption in buildings corresponds to 45% of total energy consumption worldwide). For this, they focused on the development of concrete blocks that substantially improve the conservation and thermal insulation, so that this is reflected in the reduction of the use of conditioning equipment. "Another way to achieve a significant reduction in energy consumption," the researcher added, "is the use of the internal thermal accumulator mass, which acts moderating the temperature oscillations and is equivalent to a thermal flywheel that accumulates in the charging process (when this mass is heated or cooled) to return, later, that energy accumulated in the discharge process when the conditions of the internal radiant temperature change. In both loading and unloading, the processes of energy transfer are carried out, fundamentally, by convection and by radiation in the infrared, and they are natural. Both techniques added together constitute the first and fundamental step to reduce energy consumption in buildings. It is important to note that the thermal insulation should be located on the outside of the wall and the accumulating masses on the inside, never in the opposite direction as is usually done". Among the most outstanding favorable characteristics of the hollow concrete blocks found in the market we can highlight the dimensional uniformity, the modularity, the ease of handling by the worker for having an adequate weight, the good resistance to the compression efforts that they allow the incorporation of reinforcements to absorb bending and torsion efforts. "If manufactured under strict quality standards can contain low amount of moisture in its mass, one of the most frequent problems in this type of material. But, as we said before, among the most notable defects we can point out its insufficient response to the new thermal behavior requirements. In this, the hollow concrete blocks of the hollow ceramic bricks are not differentiated, "said Yarke. 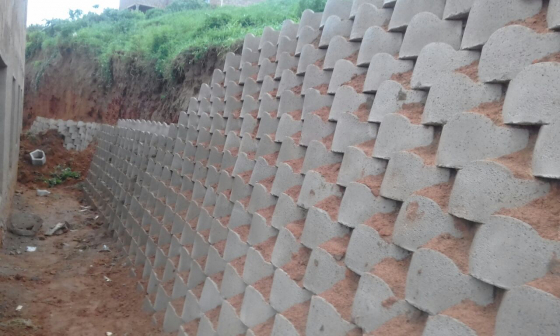 The improvement that was developed and applied to the hollow concrete blocks is of design and consisted of the incorporation of lateral fins (on the external face) and increase of mass in the internal face. The architect Yarke explained that "the fins, located mostly in the center of the holes, where the thermal bridge breaks, facilitate the placement of different thermal insulation, as support and support for polyurethane type insulation expanded applied with gun or guide and support for insulated plates cut to measure (of the expanded polystyrene type, commonly known by its brand Telgopor or also glass wool plates). The fins, still visible after applying the thermal insulation, serve to join expanded metal, geotextile or plastic fabric, which receives in a more stable form the exterior plaster with the included waterproofing". "The other improvement that the block has is the increase in the thickness of its internal face (up to a maximum of 4 cm) in order to increase the thermal mass accumulator and, in turn, the thermal efficiency of the wall against the oscillations in Indoor air temperature throughout the year. The thermal mass offered by the concrete blocks is insufficient for greater energy efficiency, "said Yarke, and stressed that" with these two improvements compared to the classic concrete blocks, a new material is achieved that better meets the current need for energy buildings. More efficient and contributes both to the reduction in the amount of CO2 emissions to the atmosphere, as well as to a greater diffusion in the use of the concrete block ". The main idea is to increase energy efficiency. There are different types of concrete blocks in the market. The most famous type is Fly Ash concrete block. There are so many good companies that will provide you a decent Fly Ash Concrete Block Making Machine India.